My children will have a new cousin very soon! We are anxiously awaiting news today of the newest addition to our extended family. Little babies bring so much joy to families. However, sometimes siblings get a little jealous and may find the bundle of joy more annoying than cute. I'm interested to see how my nephew handles the upcoming changes. Hopefully, he won't have difficulty adjusting. My daughter embraced her new baby brother and never really seemed to show much resentment towards him. But now that he's a little older and more mischievous she gets a tad annoyed when he messes with her toys and she does get slightly jealous when he gets more attention. Everything was fine UNTIL her little brother, Marvin, came along. When Lizzie tried to tell a story before breakfast, her mother said, "Not now, dear. Marvin has a dirty diaper." When she tried to tell her father a story after dinner, he said, "Maybe later, Lizzie. It's time for Marvin's bath." 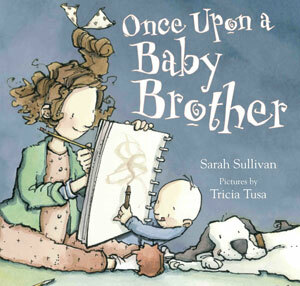 Author Sarah Sullivan gives the classic sibling rivalry theme a comical and story-filled slant in her newest children's book about a big sister/little brother relationship. 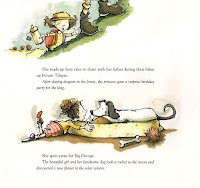 Lizzie, a young storyteller, loves to entertain everyone with her imaginative stories. When Marvin (her little brother) is born she continues telling stories but her parents are often too busy to listen. Lucky for her, she begins second-grade and her teacher, Miss Pennyroyal, encourages all the kids in her class to write stories. Lizzie ends up coping with her pesky brother by writing stories that star Marvin as an unpleasant character -- he's an ugly prince, a Marvinosaurus and even a nasty pirate. Lizzie uses her special Princess Merriweather pencil and her creative stories starring Marvin flow forth onto the pages. Then one fateful week Lizzie can't think of a single idea for her new school assignment. A hero eventually emerges and Lizzie realizes that having a sometimes annoying baby brother isn't necessarily a bad thing. This amusing tale not only helps children appreciate their siblings but it also may inspire a new generation of writers. I was expecting a book about siblings but I wasn't expecting the amazingly creative ways Sullivan manages to make writing sound exciting for children. Seriously, where can we get our very own Princess Merriweather pencil topper like Lizzie's? Teachers and parents will find this book useful in helping children overcome writer's block by encouraging kids to write like Lizzie and describe their own personal experiences. Tricia Tusa happens to be one of my favorite illustrators and has a talent for bringing creative children characters to life (see my reviews of In a Blue Room or The Magic Hat). Her familiar, whimsical illustrations work perfectly in this story, and I especially love how she realistically includes multi-racial characters, even a minority teacher, in Lizzie's class. All of Lizzie's facial expressions are fantastic, especially those showing her exasperation and frustration with her brother. And once again I must mention Tusa's awesome illustrations of the Princess Merriweather pencil topper -- quirky perfection! Like Lizzie, my daughter also loves to write and illustrate her own stories. Sometimes her stories include her brother, but I don't think she's ever turned him into a nasty character. I could see the wheels spinning in her head though as I read Sullivan's story aloud. I know she gets impatient with her little brother every once and awhile. She connected more deeply with this picture book than many others and it has already inspired her! Immediately after we read the story together, she grabbed a marker and some paper and set to work on her own book. While it didn't include her brother, she did say if she writes a story about her brother he'll be a great character. Awww, it just pulls at my heart strings! Lizzie, the main character in Once Upon a Baby Brother , is obviously is a good role model. However, I do think that a better title for this story would be "Once Upon a Little Brother" because the little brother in the story is more young toddler-aged than baby. Little brothers do indeed know exactly what buttons to push to aggravate their big sisters! 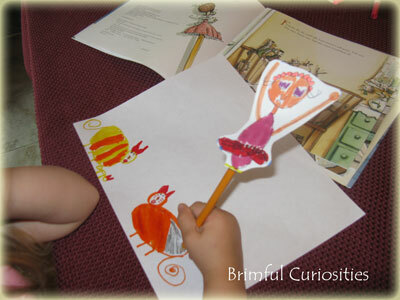 We couldn't resist making our own Princess Merriweather pencil topper! It's always more fun to write when you have a fun writing instrument. My daughter went simple with this craft and drew her own princess (a ballerina version) on some card stock, then we taped the princess to a Number 2 pencil. Super cute, super easy and ready for some novel writing adventures! Scholastic article - "Help your child overcome writer's block"
JKSCommunications has kindly offered to giveaway one copy of Once Upon a Baby Brother to a Brimful Curiosities reader. To enter, leave a comment relevant to this post or share a sibling rivalry memory. • Contest ends on Monday, June 21st, 2010 at 11:59 PM CST. This book looks great! I have two sisters and one brother, so I can think of a lot of stories- luckily, we are all very close as adults. My older brother would pretend he was the hulk and throw me around. My older sister would fight with me alot- one time she even locked me out of the house! Hope I win the book. My 6 year old is adjusting well to having a baby brother, but there are moments where I can see she struggles with it when I'm not as available for her. ps. Thanks for the comment- great idea to draw a maze with chalk for the bikes. Just thinking - toy cars would be cute, too. Make a chalk racetrack. I posted on my blog. I love Tricia Tusa too! She's had some great titles of late. And that's a fabulous homemade pencil topper! Homemade stuff is the best. I am a follower. The timing is right for this book. My daughter is expecting a son in about 3 months. Her daughter Haylee is excited right now but I can see them having problems down the line. She's always been the center of attention. When my babysister was born my younger sister Pam brought diapers and a bottle to my parents and insisted they put the diaper on her and give her a bottle and send Patty back to the hospital because she wanted to be the baby. This jealousy carried on for years and years. Whenever we played a game she always had to be the baby. when my sisters and I started fighting my mom would always say I'm going to send you outside so the neighbors can see you fighting. Sibling rivalry eh? Well where do I begin. The stick is MINE...that bike is MINE....that is MY juice..Moma..Moma...he's touching me. My daughter would really enjoy this book she has a brother of her own she wishes she could trade in. Thanks for the opportunity. This sounds like a wonderful book! I would love to share it with my niece who often lets those feelings of rivalry creep in! I remember when we were little, we were constantly fighting over things, toys, attention. One particularly bad day, my brother stole my Barbies and melted their faces against a light! What a cute idea to make a pencil-topper! I'm glad you included a picture of the one your daughter made... so cute! Sibling rivalry was very much there in my family as I had five younger siblings: 3 boys and two girls. We fought over everything from who got the mail to who got to put the money in the toll hamper. I would not have traded those times for the world. Please enter me into this giveaway. Such whimsical illustrations!! My fingers are crossed!! Thanks the timing is right. My daughter is expecting a son in September. Her daughter Haylee is excited but at times we see the jealousy popping out. I believe this will be a useful book. I am the youngest of 4. One Christmas, I had written Santa and asked for a horse. On Christmas morning there was a saddle under the tree with a note from Santa saying that he had brought ALL of us a horse to share. When the rest of the family awoke, the note had disappeared! I insisted that the horse must be mine since I had written the letter!! I never did like sharing!! My sister thought she would be funny once when I was little and gave me a bottle of ammonia to sniff. It wasn't so funny. We became best friends by the time we were in late teens. I thought my 2 year old would be happy to see his baby brother. He seemed like it as he'd stroke his face then try to scratch him! or he'd try to pull him out of the infant seat. I would love to have a copy of this book to read to my son! We are making plans for a sibling and we're so worried as to how he will cope with having to share us. Two of mine are constantly fighting.. wish I could stop it! I just love the illustrations in this book. My brother and I always were fighting we were always trying to do better than the other, my kids fight but not like my brother and I they are only 3 and 4, I am working hard in getting them to be close, like I wish I was with my brother. My brother are still playing a tennis game from decades ago! I feel bad that as the oldest, I wasn't kinder to my younger sister. I really like her and looked up to her even though she was younger. My 4 year old daughter just got her very own baby brother. We would love this book for her! Would love to win a copy of this book... many of my preschoolers this year welcomed new siblings to the family and seemed to have a hard time adjusting. A new supply of "new sibling" books might come in handy!